Schematic procedure for using the EpiQuik General Protein-DNA Binding Assay Kit (Fluorometric). Nuclear extracts treated with H2O2 as well as untreated extracts were prepared from MCF-7 cells and used in the detection of estrogen receptor-DNA binding with the EpiQuik™ General Protein-DNA Binding Assay Kit (Fluorometric). The fastest procedure available: a complete assay can be finished within 3 hours. Fluorometrically qualify or quantify protein activation and use radioactive-free materials: safer to handle. No requirement for coating antibodies, or for using secondary antibodies, or for labeling oligo-nucleotides: save time and reduce labor. The EpiQuik™ General Protein-DNA Binding Assay Kit (Fluorometric) is designed for measuring the transcription factor (TF) of DNA binding activity in nuclear extracts. In an assay using this kit, target TF in nuclear extract is captured by high affinity antibodies onto the assay microwells. A double strand oligonucleotide (oligo) containing DNA binding consensus sequence for the target TF is added into the microwell and bound to active TF in the binding assay buffer. The bound oligo is then fluorometrically detected. Fig. 1. 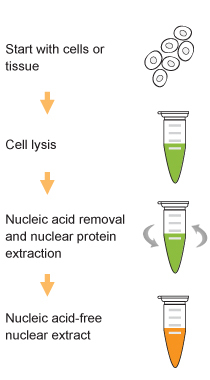 Schematic procedure for using the EpiQuik General Protein-DNA Binding Assay Kit (Fluorometric). Fig. 2. Nuclear extracts treated with H2O2 as well as untreated extracts were prepared from MCF-7 cells and used in the detection of estrogen receptor-DNA binding with the EpiQuik™ General Protein-DNA Binding Assay Kit (Fluorometric). Gao Y The Univer et. al. (June 2014). Up-regulation of Hepatic VLDLR via PPARα Is Required for the Triglyceride-Lowering Effect of Fenofibrate. J Lipid Res. Herrera F et. al. (December 2010). Synergistic effect of retinoic acid and cytokines on the regulation of glial fibrillary acidic protein expression. J Biol Chem. 285(50):38915-22. Yu Z et. al. (March 2010). CREB trans-activation of disruptor of telomeric silencing-1 mediates forskolin inhibition of CTGF transcription in mesangial cells. Am J Physiol Renal Physiol. 298(3):F617-24.